They say that your skin goes through its repair phase through the night. Whilst I'm not sure how much I believe that, I do think that overnight is one of the best times to treat your skin as you don't have to worry about applying make-up afterwards or exposing it to pollution, harsh winds or the sun prior; the treatments can simply do their thing undisturbed as you sleep. I have a variety of products in my skincare drawer that I will reach for if my skin needs a bit of TLC, all of which I find are best used overnight. Weleda is a brand I've recently been introduced to and have been loving. Their products are all natural and both their Wild Rose Night Cream and Aknedoron Purifying Lotion are fabulous for pampering your skin overnight. They're both designed to be used of an evening but Wild Rose Night Cream is for restoring moisture whilst the Purifying Lotion is for blemishes and problem skin. Some effective overnight blemish treatments can be quite drying, but this Purifying Lotion is the complete opposite and is rather very calming. Whilst you can feel the lotion dry on your skin, it does not feel tight or leave your skin stripped or dry in the slightest. For those of you that do suffer with dry skin Weleda's Wild Rose Night Cream is a God send. I don't personally suffer from overly dry skin but I love this as it not only re-hydrates and treats dry skin but also nourishes your complexion giving it added radiance and banishing dull skin. This night cream also smooths out fine lines and softens wrinkles so this is a fabulous all-round product for a multitude of skin woes. 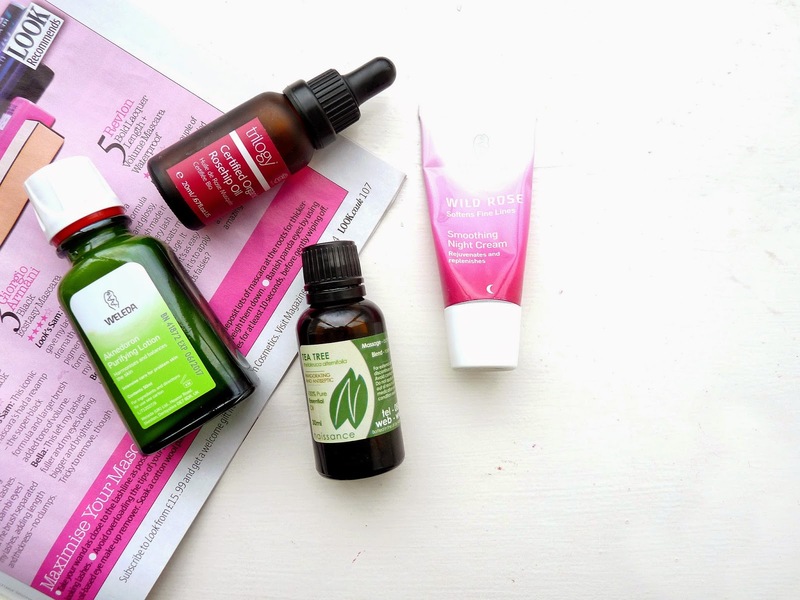 Despite the fact that Trilogy Rosehip Oil and Tea Tree Oil are both natural oils that are hugely beneficial to your skin, they are quite different and I find myself reaching for them for different reasons. Trilogy's Rosehip Oil is something I know a lot of people adore and although you can use it at any time of day, I like to apply it at night time as it's quite a oily oil (sounds stupid, but it's the best way to describe it) and as someone with oily skin this can make me look a little bit shiny, so I find it best to just use at night. Trilogy Rosehip Oil has an amazing reputation and with good cause, it's a multitasking product which boosts the overall texture and appearance of any skin type. Not only is it great for boosting radiance and moisturising dry skin, but it also improves the texture of your complexion by evening it out, fading dark marks, scars and fine lines. I've found this is also great for reducing redness and the appearance of blemishes, this is one I save for when my skin needs a lot of loving. The very different but equally as impressive Tea Tree Oil is probably one of my most used natural oils. I've very blemish prone skin when I feel a cluster of pimples appearing or an under the skin beast starts to raise this is what will be on my face that night. I find Tea Tree Oil fabulous for nipping spots in the bud before they get a chance to develop and reducing the amount of time that blemishes live on my face. The smell is very strong and I know that can worry people with sensitive skin, but it's really nothing to worry about. I have sensitive skin and I've never encountered a single problem whilst using Tea Tree Oil. The only issue I've ever had with it is that I always run out so quickly! 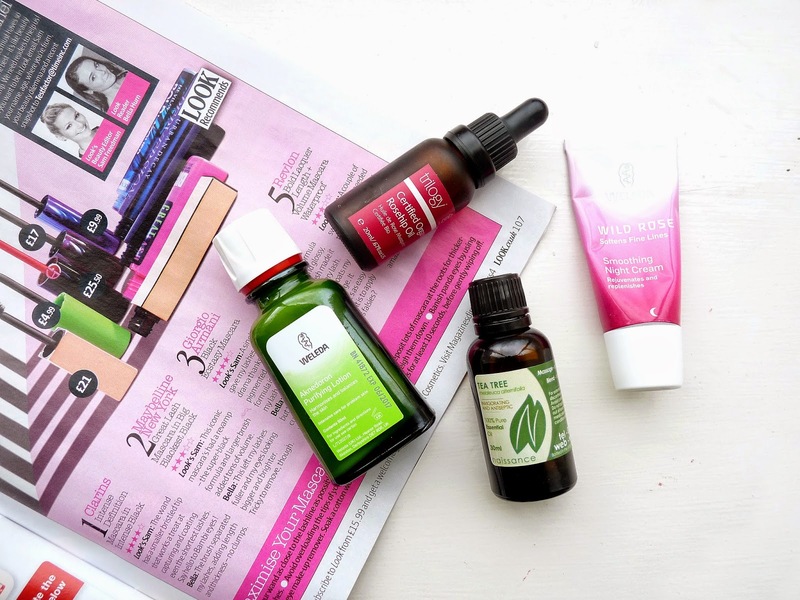 These overnight skin saviours cover a range of skin problems and these are all treatments that I personally swear by and always turn to with my skin worries. What are your go-to products for overnight TLC?